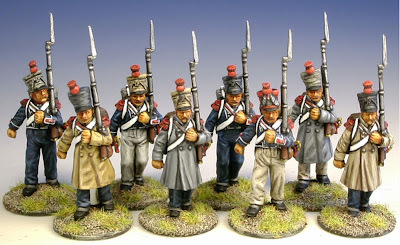 Finished the 12 Perry Riflemen yesterday - they took about a day & a half. Pretty fast for me - the color scheme being fairly simple - mostly green and black. I split the sets of command and riflemen into a unit each of the 95th and 60th; there were two each officers, buglers, and sergeants in the command pack. The guys on the far right in the top two photos are the plastic Perry Riflemen that came with an issue of Wargames Illustrated. The third photo shows the pack numbers that are decals from Alban Miniatures. I didn't add the canteen decals as they were kind of small - maybe someday when I have more patience. I used Micro Sol to have them seat right - but it appears the bugler's needs a little more on the right pack strap. For Sharp Practice, Rifles operate in groups, and cannot form into formations (more than one group). Groups are a minimum of 6 figures - less than this number and they lose their bottle (basically break). The plan is to increase these two groups by eight Victrix Portuguese Cacadores - for a fairly large group size of 15 each - maybe too large? I'll have to see when I play test them. The British Rifles will be classed as Elite and the Portuguese as Good - I think you can combine different troop types - if not, it will be a "house-rule." The Warzone hill terrain arrived the other day. I was surprised to see how slim the mailing package was - they really know how to maximum space in packing. 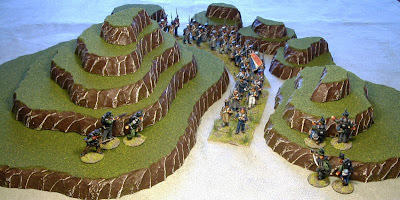 Below is a staged shot of how the hills can be placed for an ambush type of scenario. 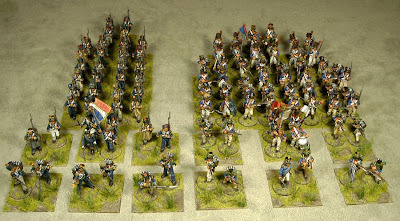 Here's a comparison shot of the few 28mm Napoleonic makes I have. Of course, the poses have a lot to do with it, and none of the Front Rank Spanish Guerrillas I have are actually standing straight up - except the leader guy, but his is sort of an exaggerated pose so I didn't use him. The Foundry figure's base is built a little higher. Some of the other Foundry in the Napoleon and Staff set are shorter than this figure. I don't have any Front Rank uniformed troops, so this comparison may not help some folks. The guerrillas are all in advancing or firing poses (leaning a bit forward at that), which should help mask any sculpting style differences. This shot compares the Perry metal Riflemen (primed) and the Perry plastic Riflemen (painted) that came as freebies with an issue of Wargames Illustrated last year. The plastics seem ever so slightly thinner - but it's hard to say since there are only two of them to compare against. The only difference that I can say is for sure is that the plastics don't have cords on their shakos - whereas the metals all do. No problem with that. They will be perfect together. As you can see the guy on the far left in the photo is painted up as the 60th Rifles. 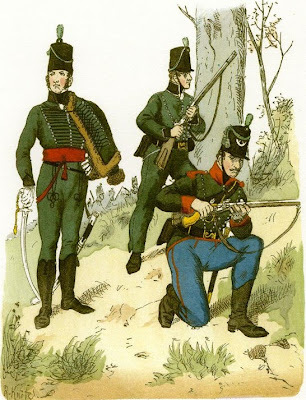 This is a nice Knotel illustration of the two famous British Rifle Regiments. Also, an update from my local gaming store indicates he won't be getting the new Victrix Cacadores anytime soon. So, I opted to order from a vendor in the UK that doesn't charge shipping - but does charge 15% VAT as I found out during the checkout. This was the exchange rate today per Paypal: 1 USD = 0.638750 GBP. I think this is better than the same time last year - I think. I hope the Porks get here soon - I should be done with the Perry and Front Rank figures in a couple of weekends. 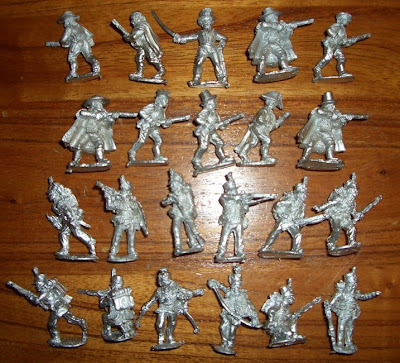 Perry British Rifles and Front Rank Spanish Guerrillas Delivered! The two separate orders both arrived on the same day! Actually, the Perry order arrived yesterday, but unbeknownst to me, was sitting in the community over-sized mail box overnight - thanks to the delivery lady not coding it right; the USPS tracker said a note was left for either pick up at the post office or another delivery attempt. The Perrys were ordered from The WarStore.com and the Front Rank figures from Triangle Miniatures. The Perrys were on backorder for a couple of weeks (these figures are quite popular). Thanks to those two vendors (Neal and Buddy) for getting the orders out as soon as possible. Here's a snapshot showing them as soon as I pulled them out of their packages. The top two rows are the Front Rank figures and the bottom two rows the Perrys. The Front Rank figures are very, very nice, with loads of nice detail; like the hairnets on some of them -Wow! The Perrys are of course up to the expected fine sculpting. They're all pretty cleanly cast; only one of the Perry officer models had a bit of flash - mostly on his sword because of the way it was cast. Note of caution: As I was cleaning the flash off the officers saber, it bent into an S-shape, I'm straightening it out now, but if you have the same flash issue, be careful removing it - don't want to break the tip off the saber. They look like they will match up very well with the Perry and Victrix plastics. These will all be mounted singly on metal washers. They will be used as skirmishers per Sharp Practice. The Spaniards will initially have a "Poor" rating - they might work their way up in future games though. The British Rifles will be split into two groups - one representing the 60th and the other the 95th. Both served in the Peninsular, sometimes side-by-side (at least in the "Sharpe's Siege" episode of the TV miniseries!). They will also have Portuguese Cacadores integrated with them - once those Victrix metals get here. 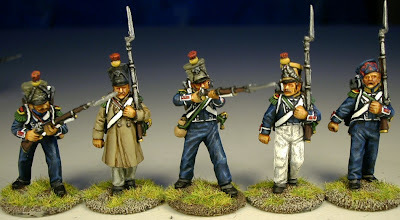 The Rifles should paint up pretty quickly - mostly green and black - the 60th will have red facings and blue trousers - at least some anyway. We'll see if they can be painted within a week. The Guerrillas may take a little more time - mainly because I want to make sure they look like an unconventional unit with each guy having a bit of individual flair. *******UPDATE (like Robert Stack used to say on Unsolved Mysteries)*******: The box of Perry Riflemen has been located. They were actually in our community oversize mail box. However, we only found this out after my wife went to the local PO and the box wasn't there - so they found the actually delivery lady who explained what happened. She said she put the box in the oversize mail compartment, but that the key for the front of the box was broken off, so she just shut the back door - my wife went back home and pried opened the back of the box and there was the package. I suppose anyone could've opened it and taken it. The Home Owner's Assoc. shall hear about this! (They probably want a reason to raise the annual fee anyway). I just wish the delivery lady had put a note in our normal box to say the box was in there instead of what the online USPS tracker said, "attempted delivery - no one home; note left." Anyway, I will see these Riflemen tonight! *****FROM YESTERDAY********* I received an email confirmation that my order of Perry Riflemen was "attempted" for delivery at home, and a notice was left. I called my wife and she checked the mail box and our front door - no notice found. I called the local PO and they said the delivery trucks are still out so no sense coming in today (they close at 5:30 & I get off work at 6:00). The guy at the PO said my wife could pick it up tomorrow with something showing our address (like a bill), and the tracking number. I hope so. I went online & requested "Customer Picks Up" - hopefully this will keep the package from going out the door before my wife gets to the PO tomorrow. Oh well - patience is a virtue, but I better have 'em when I come home from work tomorrow! Addendum: Buddy from Triangle Miniatures just let me know that the Front Rank Spanish Guerrillas were mailed out last week also, and I should be getting this package soon too - well, hopefully not like the Perrys, but in my hot hands. I hope to have both started by this weekend. If all goes to plan (like that ever happens! ), the first playtest should be on the second Saturday of next month. I won't wait on the Victrix Portuguese - I'll adjust the game to allow for their inclusion later. The 95th & 60th Rifles decals did arrive today - these were ordered direct from Alban in the UK - and it was only ordered last week. I will definitely consider ordering direct from the UK in the future. Rather than wallow in self-pity, I managed to finish flocking the magnetic, yep magnetic, bases of both the French and British. I know, it's a lot of extra work when I could've just mounted the figures directly to the bases, but the initial intention was to play skirmish with single washer-based figures. In the future, for line troops, the plan is to mount them four to a 40mm square base. Maybe a few singles for casualty removal. The British Rifles and Spanish Guerrillas will be singly-based on washers though. These guys will operate mainly in skirmish formations anyway - and they are metal and don't have fixed bayonets either - less chance of damage while moving about the battlefield. Here are some pictures of how the newly flocked bases look on the light green suede cloth I picked up from JoAnns the other day. It feels good to the touch - yeah...suede. Bought a roll of suede cloth from JoAnns that was 40% off. It's a light green - I think it's called "Celery", but the website lists it as "Green Tea." The fiber is such that there's no way things will get snagged on it. In fact, that is the main problem with the tan felt cloth I already have. The fibers of the felt always seem to get caught when trying to lift figures (both single based or on movement trays) - the natural reaction is to let your grip slacken on what you're trying to lift - not a good thing. The suede cloth is just shy of 5 feet wide (4 feet, 11 inches) with the those edges already sewn from the manufacturer. The length is now a little over 9 feet - it was the end of the roll so I told them to just keep it on - not knowing it was that much longer. My wife already sewed the long-ends, but I will ask her to shorten it to 8 feet. I really like the tan felt's color; and was actually at JoAnns looking for a green spray paint to add some variation to it. However, with the combination of the 40% off, fine texture of the suede, and the fact that the felt cloth was only about 6 feet square - the decision was made to go suede. An idea for the tan felt cloth may be a shoreline for the Hotz Roman Seas hex mat. Although, I'm going to give it a little more thought before I take out the pair of scissors. Yesterday, I tried shaving the tan felt cloth in the way we used to shave wool berets to remove the "fluff." Didn't seem to work while testing the movement of figures; some of the wool fiber still was being grabbed. Took this photo of the Perry and Victrix French infantry in Attack Columns though - not a total loss. he Perry British Riflemen that were on back order came in and have been shipped as of today (per the UPS tracking). Also, the Front Rank Spanish Guerrillas are also supposed to be on their way. The orders were from two different suppliers; both Stateside and both on the East Coast – hopefully the weather won’t cause too much of a delay. 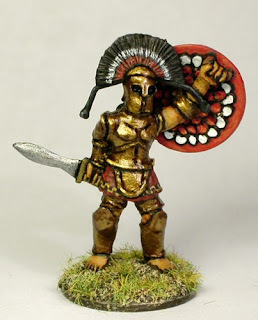 Not exactly sure of the status of the Victrix Portuguese Cacadores that were actually the first items ordered – about 2 ½ weeks ago; these were ordered through the local gaming store here, who in turn orders through another retailer – so, I assumed it would take awhile. At least, the other figures should be here soon and can be started on. Some 95th and 60th Rifles decals from Alban are also on their way. This is the item description: "A big bag'O'hills, a Veteran Gamer's starter set. Don't go to War without it! 15 Pieces from 2" x 2" to 12" x 14". Serpentine Contour gives pieces a more natural look. This Set Creates a 2' x 4' (dense) to 4' x 4' (sparse) Gaming Area." I think this is the same company that Dan and Adrian bought their respective 8’ X 4’ gaming boards a few years ago - and still looking great. I figure this set should provide good obstacles – both for movement and sight – between the advancing British and garrisoned French. Along with the Old Glory Spanish church, a few wooded areas and maybe a stream should complete the terrain needed for the Sharp Practice game planned for Enfilade in May. Speaking of Spaniards, images of Spanish Guerrillas are few and far between on the internet. 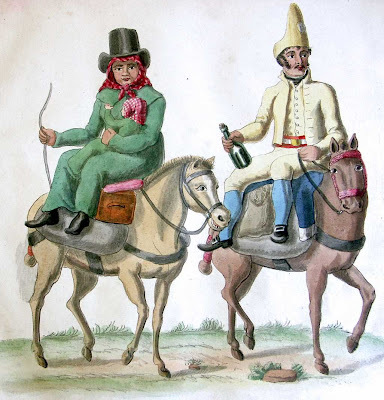 Here are a few I did manage to find - actually the period illustrations by Suhr may not be actual Guerrillas, but they pretty much wore civilian clothes - besides whatever military clothing they could acquire. While anxiously awaiting the arrival of a few more Napoleonic figures, the 1st Corps Spartan hero has been completed. He only needed a few finishing touches and his base flocked. This is the guy who comes sans clothing, other than his bell-cuirass, greaves and Corinthian-style helmet with transverse crest. His legs were lengthened with pins, and Green Stuff used to give him a tunic, as well as some supplementary armor. An LBMS transfer helped out on the shield's face. He's based on the illustration of early-6th century BC Spartans from the Osprey Spartan Elite book. The sculpting seems a bit cruder than more recently released Greeks, but has a nice appeal to him nonetheless, actually a bit heroic, I think. 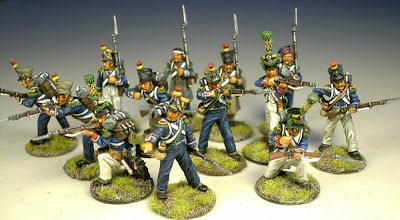 Finished the box of Perry French Infantry. They are painted up as Light Infantry. 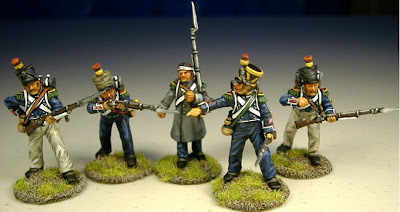 The finished Voltigeurs were posted earlier. Here are the Carabiniers - these are the equivalent of Grenadiers in Line units. They have a little more oomph in Fisticuffs according to Sharp Practice rules. The premise being these were the largest and strongest men in the unit. 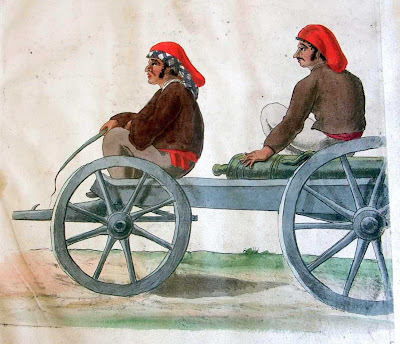 Supposedly the Napoleonic French army fed these guys more food on account of their size and strength - I doubt that this would go over well in today's armies. 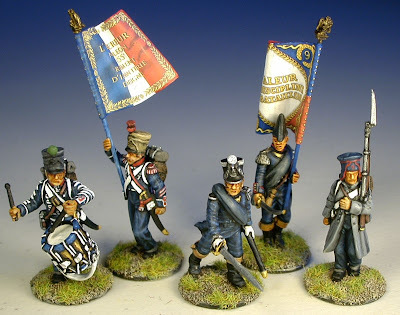 Next, the center companies of Chasseurs - the equivalent of Fusiliers in Line units. Their colored shako pom poms are the same colors for the corresponding line companies - 1st company = green, 2nd company=sky blue, 3rd company=violet, 4th company=orange. Here's the command group - which in Sharp Practice really doesn't exist per se. There are Big Men and musicians, but standards are not really a factor - unless you make the figure a Big Man, I suppose. 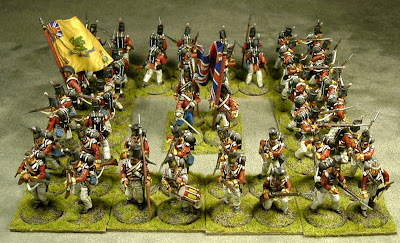 The two post-1812 colors included in the set are for Line Infantry units, but it's hard to see the actual numbers on the flag (or even the "Ligne" for Line) unless you look really close. The Porte Aigle on the right is a spare Victrix figure with the pre-1812 colors - if he's substituted for this unit, they can blend in with the Victrix Line unit better. The original "8" was painted as "9" to represent the 9th Light Infantry. The 9th Legere served with distinction in the Peninsula. The guy on the far right is a regular Chasseur who failed to report for the previous photos and was just milling about - so he was ordered to cover a flank here. Addendum: The top of the drummer's left drumstick wasn't painted in the photo; Since corrected. This is the whole battalion with Voltigeurs out front screening. Hopefully the Perry British Rifles and Victrix Cacadores will arrive soon. Some Front Rank Spanish Guerrillas have also been ordered. I already have a name for the Guerrilla Big Man - Tuco Benedicto Pacifico Juan Maria Ramirez, in honor of the character famously portrayed by Eli Wallach. Last weekend, while painting this unit, the "Man with No Name" trilogy was on. The musical score and the film's location in Spain was inspiring and seemingly appropriate. Post Script: My overall impression of the Perry plastics is highly favorable. I have the French Heavy Cavalry in addition to this set. Both sets were very straight-forward, as plastics go. The cast-on heads on this set are a tiny issue if you want to replace them with one of the optional heads (with pokelems, etc.). You need to be sure not to damage (or cut off) nearby parts that are also cast as one-piece on the figure - such as the muskets on the marching poses. Compared to the Victrix sets which I also have, the Perrys are one-step faster to work on. Specifically, the heads and arms cast on most of the figures do speed up the process - more so psychologically for me. Only the six skirmish poses require any of these extra steps. Of course, the reason for this being the very fact that you can make most of the Victrix sets into skirmish, or other unique, poses. Which some may prefer over marching poses. About 90 percent of the Perry set are marching poses. Initially, the skirmish poses were my reason to chose Victrix. However, since gaming them, even for small skirmish games like Sharp Practice, I've found that the firing and lunging poses with bayonets out front are problematic. Mainly for ranking them up for movement, and also possible breakage. So, the Perrys being in mostly marching poses for easy ranking up have me swayed more towards them. One other difference that I notice between the two, is the type of plastics they use. The Perrys seem tougher, and the Victrix seem more brittle/weaker. Now this difference could be the reason some of the details seem clearer or finer on Victrix. The differences are, in reality, very slight and I have no reservations acquiring more of either manufacturer. For the previously painted Victrix French & British, white was used as an undercoat as I thought it would be a good foundation for their cross-belts, straps, white trousers, and lapels for the French. It did, however, require black lining all of those aforementioned areas. Black was used for the French Heavy Cavalry and this Perry French Infantry set because of the large amounts of armor on the Heavy Cavalry, and the Infantry to be in predominantly dark blue uniforms. This also helped to minimize the need to black line - although I had to be a bit more careful painting on the belts & straps to stay within the black lines (just like grade school coloring books). BTW, I don't use "real" primer, but the cheap cans of flat white and black spray paint from Walmart instead. For Ancients, with a lot of exposed flesh, I tend to use white undercoating - this way the flesh colors are built up easier. In fact, I sometimes use thinned-down flesh over the white undercoating so the recesses are a bit darker. I follow this up with a reddish-brown wash which further darkens the recesses. Finally, a lighter flesh and white mixture is added on the highlights. If the figure is wearing bronze armor, I like to undercoat those areas only with a dark reddish-brown mixture. This also works well to undercoat most horse-hair (either on helmet crests or the horses manes & tails). Speaking of horses, I undercoated some of the horses for the Heavy Cavalry with a Sand/Tan spray. This was followed with a wash of dark reddish-brown ink/stain. A final coat of lighter reddish-brown was dry-brushed on for highlights. This was a fast process and the result looked pretty good for the effort. I plan to use this in the future for horses that are bays. Ten-man unit for Sharp Practice; led by Sergeant Blasé Blasé (pointing). Here they are with some Victrix Line Voltigeurs; they are a good match in both size and sculpting sytle. Both Voltigeur units can be in either line formation - along with their parent unit brethren, or break out as a group into skirmish. This is unlike the British Rifles who can only skirmish - at least according the Sharp Practice rules. Next up for the paint brush are the Carabiniers (foot types); then the Chasseurs (or center companies). At this rate, I should be done before the Perry Riflemen and Victrix Cacadores arrive. If not, more incentive to pick up the pace.